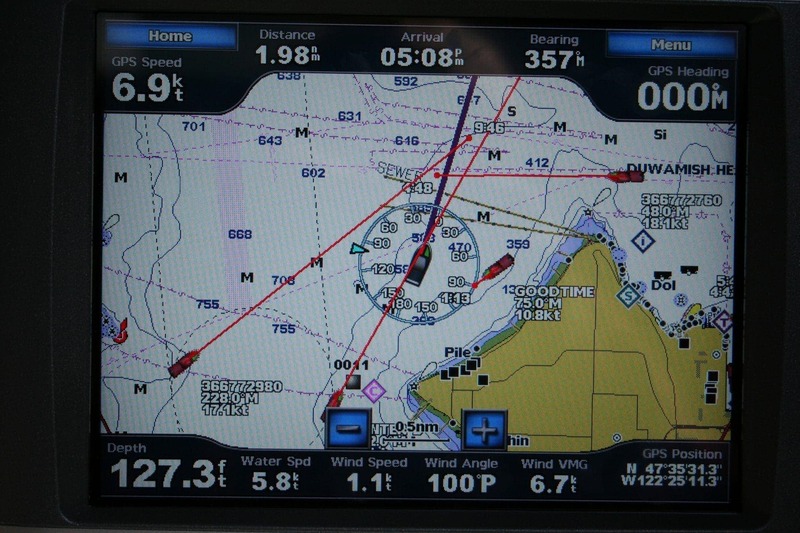 Above is a screen shot from my chart plotter at the end of the day when I was sailing/motoring back into Elliott Bay here in Seattle. The larger boat icon in the center with the compass wind indicator around it is me, the rest of the smaller boats with red lines emanating out of them are all of the AIS targets my system is warning me about. I had 3 Washington State Ferries closing in on my area – two car ferries and one fast passenger ferry, one tour boat, and eventually 2 tugs, one of which was going faster than I was, and on a similar course. AIS here only showed 2 of the three ferries, the tour boat, and the tug. I couldn’t take any more pictures of the system becaue I had to pay attention at that point, but it was pretty nice to be able to sit in the cockpit hatchway and glance down to see what else was coming around the point behind the bluff. I still haven’t figured out a great way to use the notification system within the Garmin unit for AIS. It goes off far too much and alerts when there are boats nearby on AIS sitting still. Other programs that are software based have more granularity and allow you to only fire off an alert when specific conditions are met, such as intercept within a certain amount of minutes. I’m hoping Garmin will get to that soon.